A variety of dishes can be prepared from this versatile potato. Delightfully flavoured, exceptional creaminess and smooth texture , a perfect choice for any consumer! Vivaldi is a mid-season variety. 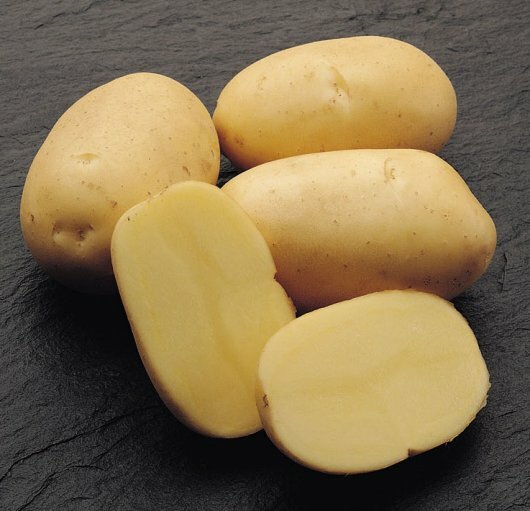 Oval tuber shape, nice light yellow skin and light yellow flesh colour. Very uniform potatoes with a high percentage of marketable product. Relatively high tuber set, medium-large tubers with regular size distribution. Vivaldi also has good storability. Responds positively on appropriate Nitrogen application. Magnesium foliar applications gives a more vigorous crop. Vivaldi is somewhat susceptible to black spot bruising and pressure bruising. Take extra precautions during harvest, handling and storage. Rapid development, medium to tall plant, good ground cover with white flowers. Determinant growth habit, not demonstrated problems with vine destruction. Immune to Wart disease. Good resistance to virus diseases. Moderate susceptible to common scab and early blight. The culinary qualities of Vivaldi are excellent. Bring out the best flavours in this tasty potato by baking, boiling or steaming. Rather low specific gravity and no discoloration after cooking.